The UPA government is holding an all-party meeting here tomorrow in an attempt to resolve the contentious Amarnath Shrine land transfer issue, which has polarised the people of Kashmir valley and Jammu on communal and regional lines. As the violence in Jammu and Kashmir shows no signs of abating, a worried Centre is mulling the possibility of putting off assembly polls and clubbing these with the Lok Sabha election next year. Prime Minister Manmohan Singh may have ensured that politics does not hijack his family’s celebratory moments this evening, but he could not, after all, shun his concerns over the Indo-US nuclear deal. Stating that there exists an ‘unwritten consensus’ among political parties to extend government support to the religious groups irrespective of faiths, the BJP today said the revocation of land transfer order to Shri Amarnath Shrine Board was a ‘serious compromise’ of this culture of consensus under the pressure of separatist elements who never accepted Jammu and Kashmir as part of India. The long talked about recast of the Punjab Pradesh Congress Committee (PPCC) has been reportedly finalised and is expected to be announced in a day or two. In this, the aspirations of the factions of Amarinder Singh and Rajinder Kaur Bhattal have been taken care off, sources in the Congress confirmed today. The Maharashtra government is all set to increase recruitment of Muslims in the police force and deploy more members of the community in the Special Branch and Intelligence wings as part of measures to increase security. Veeranna Mathikatti of the Congress was elected chairman of the Karnataka Legislative Council today. The 29-member Congress received the support of the 13-member Janata Dal (Secular) in the 70-member (the original strength of the council is 75, but five seats are vacant) House and that should have left no one in doubt about the Congress candidate bagging the post without any difficulty. Students have deserted spiritual Guru Asaram Bapu’s ashram-school at Chinndwara in Madhya Pradesh, where two of them were murdered in the past fortnight. Of the 300-odd students in the ashram, a residential school, only 20 remain. Asaram’s another ashram-school in the state at Jhabua, has been closed down. The Bombay High Court today admitted an appeal against actor Sanjay Dutt and his wife Manyata challenging the Sessions Court order that upheld her divorce with former husband Merajur Rehman. CPI general secretary A.B. Bardhan reiterated his preference for Mayawati as the future prime ministerial candidate. If you are wondering where money comes from for riots, bomb blasts and other criminal activities then the latest report from KPMG clears the suspense over it. Japan today asserted that there was no change in its position that New Delhi must sign the nuclear non-proliferation treaty (NPT) and the comprehensive test ban treaty (CTBT) even as it gave clear indications that it would support India’s case for a clean waiver at a meeting of the nuclear suppliers’ group (NSG) on August 21. Demanding 40 per cent interim relief for journalists and non-journalists employees under wage boards, the Federation of PTI Employees Unions today asked the Central government to issue a notification in this regard at the earliest. The US today asked India not to talk about “unconditional” waiver from the Nuclear Suppliers Group (NSG), as it was “provocative” ahead of the meeting of the 45-nation grouping. Almost 4.2 crore Indians suffer from vascular problems that could require amputation of legs if not treated on time, according to a report prepared by Vascular Society of India. The Meghalaya government has launched a project to revitalise the traditional herbal health care system in the state’s tribal society with a focus on giving a new lease of life to traditional healers in the state. The hill state is known to be a treasure trove of medicinal herbs. Jathedar Joginder Singh Vedanti, who resigned as the head of Akal Takht, today found support from the Delhi Sikh Gurdwara Management Committee (DSGMC), which called his “removal” as highly “unjust” and questioned the process and the reasons for his removal. The Congress today confirmed that Sonia Gandhi would attend the August 8 opening ceremony of the Beijing Olympic Games. Yesteryear actor Manoj Kumar today filed a case against actor Shah Rukh Khan, producer and director Farah Khan and Sony Entertainment Television seeking to delete a scene from the movie 'Om Shanti Om'. The government has made several efforts to persuade the BJP, spearheading the fortnight-long agitation in Jammu in the name of the Amarnath Sangharsh Samiti, to bring down temperatures. But the agitators continue to block the Jammu-Srinagar highway, the only land route to the valley. Earlier Prime Minister Manmohan Singh had invited Leader of Opposition L.K. Advani. BJP general secretary Arun Jaitley accompanied Advani under instructions from the party. Besides his family ties with Jammu through marriage, Jaitley is also the in charge of the state. The Prime Minister’s effort did not yield much. Thereafter Congress president Sonia Gandhi called up BJP president Rajnath Singh requesting him to help restore peace and remove blockade of the Jammu-Sringar highway. As a result movement of all goods from and to Srinagar has been stopped. A third attempt was made by the Prime Minister and Sonia Gandhi together last night when together they spoke to the Leader of the Opposition on the sidelines of the dinner hosted in honour of visiting Afghan President Hamid Karzai. But this too did not yield much. The government would now hold an all-party meeting here tomorrow. Advani, Rajnath Singh and Jaitley would represent the BJP. Sonia Gandhi will represent her party at this meeting. On his part, Advani asked the government to take some corrective measures. But the BJP would not say what corrective measures it had in mind apart from their basic demand to return the land to the shrine board. BJP spokesman Ravi Shankar Prasad said, “These are matters of detail”. 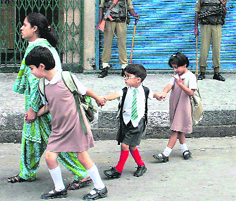 Meanwhile, the government had dispatched Union home secretary Madhukar Gupta and defence secretary Vijay Singh scheduled to return later today and make a report on the ground conditions in Jammu and Srinagar. The government hopes that in the meeting the non-BJP parties, especially its allies in the UPA and even the Left parties, may be able to impress upon the BJP the importance of restoring peace and normalcy in the state. “We are trying to develop a national consensus,” said a government source. The all-party meeting would be preceded by a meeting of the UPA leaders where Home Minister Shivraj Patil would brief the alliance partners on the gravity of the situation. The home ministry maintains that despite the protests in the valley over the acquisition of land, as many as 5.25 lakh pilgrims have already visited the Amarnath shrine so far. While the BJP is asking the government to “take some corrective measures” to “nurse the hurt feelings of the people of Jammu”, the government and the Congress are asking for the restoration of peace first and the removal of the blockade to create conducive conditions for holding any negotiations. But going by the mood in the BJP, it is not easy to persuade it. With elections to the state round the corner, the BJP is hoping to reap a lot of political mileage from this. Prasad said, “The BJP’s credibility in the state is high. It has earned itself a clear distinction by holding the only other fair and free elections in the state while it led the NDA government. Earlier, Morarji Desai, while leading the Janata Party government, held the first free and fair elections in the state,” Prasad pointed out. The then Jana Sangh was a part of the Janata Party, he said. Assembly polls in Jammu and Kashmir are due to be held by October but it may be difficult to conduct timely elections if the current spell of violent protests in the state over the Amarnath shrine land transfer continue to spread. UPA sources said given the present mood in Jammu and the Valley, the Centre feels it may be difficult to conduct two elections in the state within a span of six months and subject everybody to security risk twice over. A UPA minister said the Centre was, therefore, seriously looking at the possibility of continuing with the present spell of Governor’s rule and conducting the assembly elections along with the Lok Sabha polls which are due early next year. Even when the situation in Jammu and Kashmir is stated to be normal, elections in the border state are conducted over several phases under extensive security cover. If the present security situation does not allow assembly elections to be held on time, these would have to be rescheduled to early next year as elections cannot be held during the winter months when the Valley is snow-bound. The Election Commission is meeting here on August 11 to decide the time-table for the six election-bound states, including Jammu and Kashmir. Having said that, the PM made a quick and quiet exit from the banquet hall of the hotel, where elite of the capital, including some illustrious academicians and economists, was present to bless Upinder on her big day. The PM was, in fact, the last to walk in and the first to do the disappearing act. His better half Gursharan Kaur, however, ensured she stood by her daughter and hosted the guests. Among prominent ones present were planning commission deputy chairman Montek Singh Ahluwalia, India’s foreign secretary Shiv Shankar Menon and wife, acclaimed economist C. Rangarajan and his wife, writer-diplomat Pavan Verma, now with the Indian Council for Cultural Relations (ICCR), and the ambassadors of Pakistan, Japan, France and Italy. The peculiarity of the gathering was its uniqueness -- the kind that matched Upinder’s work (published by Pearson Education), which she later described as “a work for everyone”. In the presence of her old and new students, teachers and colleagues, family and friends, Upinder could not but hail the moment as overwhelming. As for her introduction to the book “A History of Ancient and Early Medieval India: From the Stone Age to the 12th Century” - it sounded more like a tribute to the discipline of history than anything else. “This book is an attempt to make history interesting, an effort to talk serious academic concepts with a touch of lightness,” said the Delhi University (DU) professor, who also wandered into the relationship between the teacher and the taught, while talking of the book, and the need to write it. At another end, guests were busy booking for Upinder’s work, being offered at a special price today. Copies of the book, which otherwise costs Rs 3,500, literally flew off the shelf, with even some of the attending ambassadors being interested. The book might well see some translations soon. But to begin with, it will be printed in Hindi. 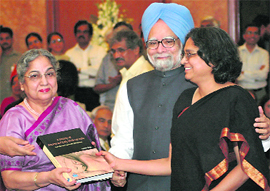 From the limited English edition, a special copy was reserved for the Prime Minister of India. For once, it was the daughter creating a photo-op for her father. And an otherwise-shy father spared no enthusiasm in grabbing one, notwithstanding the Special Protection Group. BJP spokesman Ravishankar Prasad said there had been no murmur of protests all these decades as the governments extended budgetary support to Haj pilgrimage, built Haj Bhawans for the pilgrims across the country on government lands, organised Kumbh Melas and Tublig Jamat congregations. None of these actions created controversies because of strong political consensus. But in case of Amarnath Yatra, after allotting land for raising the infrastructure for pilgrims, the Centre and the Jammu and Kashmir government succumbed to the pressure of the separatists notwithstanding 35 days of mass movement involving almost every sections of society in Jammu region claiming seven lives, he said. The Congress will implement an “out of the box” formula that will broaden opinion-base and give representation to a wider spectrum of Punjab leaders. This also means that the party will not hand over the entire power to one person - that is the PPCC chief. It is learnt that the party has formalised a thought that a small core group be formed to run the Punjab unit with a senior central leader controlling the group and using the services of the group whenever needed for specific rallies or events. The group could have anywhere between eight to 10 members - all top brass of the Punjab leadership. This will also cool down the temperatures between former Chief Ministers Amarinder Singh and Bhattal, who have been at loggerheads and have expressed that they cannot work together. The working president of the Punjab Pradesh Congress Committee, Jalandhar-based Mohinder Singh Kaypee is expected to continue on his post. Ditto for Bhattal, who is expected to continue as the leader of the Congress Legislature Party (CLP) as she is the senior most leader. In case of Kaypee, he hails from the Doaba region - where the Congress took a beating in the last assembly elections - and is also seen as a leader who can bring in the votes of the Scheduled Castes. Amarinder Singh will have an important role to play, the source said and added that it was a common belief in the party that he could take on the Akali’s on issues relating to Punjab. A review, if any, of this formula would be possible only after the forthcoming Lok Sabha elections, said sources while adding that the party was eyeing the 13 Lok Sabha seats of Punjab very eagerly. Notably after the BJP won 19 assembly seats in the urban areas, the Congress has pinpointed two Hindu leaders - one from the Majha area one from the Malwa area, who will be given important posts and visible work in the party. One of them could be a sitting MLA. Within the Congress it was opined that Hindu leaders from Punjab had to form a face of the party. Though at the Central-level Ambika Soni and Ashwani Kumar both ministers are seen as Hindu representatives and so is spokesperson Munish Tewari. State government sources say, the absence of adequate representation of the minority community in the police force is impeding law enforcement. "Since the 1992-93 post-Babri Masjid riots, the intelligence network of the police force among the Muslims had almost completely dried up," says an official in the home department. The police department then had to rebuild their contacts as Mumbai reeled under terror attacks. Intelligence gathered by the state government indicated that the Muslims of Maharashtra continued to be deeply suspicious of the law enforcement agencies and those suspected of being in contact with police officials were often at the receiving end of society. Among the measures being undertaken to recruit more Muslims into the police force include active drives to reach out to the society. "Recruitment ads would now be posted in Urdu newspapers in addition to Marathi newspapers," says a state government official. Other measures include examinations for the same being conducted in Urdu. Question papers set in Marathi were also seen as a hurdle to Muslim candidates clearing the examination. Now these students may be set lower qualifying marks. Incidentally, Maharashtra seems to have higher proportion of Muslims in the police force as compared to other states, according to data from the National Crime Record Bureau dated 2004. Muslims, who account for ten per cent of the state's population, enjoy a representation of 4.71 per cent in the police force. This is much lower than in Uttar Pradesh where the community accounts for 18.70 per cent of the population and 4.24 per cent of the police force. However, the ratio is far skewed in Mumbai city. The country's financial capital has less than 1,000 Muslims in the 30,000-member police force, say sources. Far worse than the poor representation of the community is the quality of personnel. Sources say proportionately only a small percentage of all police personnel cutting across lines of caste and creed are worth deputing for intelligence duties. What, though, generated interest in the election is the possibility of horse trading as a candidate of the ruling BJP also joined the fray even though under ordinary circumstances there was absolutely no chance of the BJP, with a strength of 23 in the council, pulling off the contest in favour of its candidate, Susheel Namoshi. Speculation about the BJP making attempts to organise cross voting by the Congress and the JD(S) members had to do with what took place in the political scene of Karnataka in the recent past. While the ruling BJP successfully poached on elected MLAs from both the Congress and the JD(S) and had a total of five MLAs from the two parties quit their Assembly seats to join the BJP, the Congress retaliated by making three BJP MPs from Karnataka ditch the party during the crucial trust vote in the Lok Sabha on July 22. The election for the post of the chairman of the Legislative Council was considered an occasion that would see the BJP settling scores with the Congress by engineering defection from the Congress and JD(S) benches. This, however, did not happen. The BJP nominee eventually announced that he was withdrawing his nomination paving way for Mathikatti to get elected unanimously. Shortly after the BJP formed the government in the state, the Congress and the JD(S) cooperated with each other for filling up vacant posts from the state in the Rajya Sabha as well as vacancies existing in the Legislative Council. But soon after, the JD(S) voted against the Congress in the trust vote in the Lok Sabha on the Indo-US nuclear deal. This, however, did not prevent the two parties for joining hand again for the council chairman’s election. While the police claims to have cracked the mystery of the death of two students — charging a 13-year-old student of the same ashram with murdering his two younger classmates — the locals are not convinced. “The young boy has been framed to save Asaram Bapu,” said Vasudev Sharma, state secretary of the CPI (M) and a Chinndwara resident. He alleged that “the medicines produced by Asaram Bapu’s pharmacy were tested on the student”. There were violent demonstrations before the ashram on Monday and Tuesday, demanding a CBI probe into the murders. Groups of lawyers, workers of political parties and parents of the students stoned the ashram and padlocked its main gate. The lawyers also submitted a memorandum to the district collector objecting to the disclosure of the name of the alleged murderer by the police on the ground that the “Juvenile Justice Act 2000” prohibits such disclosure. Section 21 of the Act says: “No report in any newspaper, magazine, news-sheet or visual media of any inquiry regarding a juvenile in conflict with law shall disclose the name, address or school or any other particulars calculated to lead to the identification of the juvenile”. In blatant contravention of the Act, the Inspector-General of Police of the Jabalpur range announced the name of the child at a press conference at Jabalpur on August 3. Not only that, the police even issued a press statement after the child was produced before a court and was remanded to the Juvenile delinquents’ home at Narsinghpur in MP. Asaram Bapu commands quite a substantial following in in the state. His disciples include at least three cabinet ministers of the state and a union minister hailing from MP. Justice Abhay Oka, who was hearing Rehman’s application, would be issuing notices to the Dutt couple, Rehman’s lawyers Taraq Sayed and Ravi Mungekar said. Meraj's application contended that the sessions court had failed to consider the divorce certificate produced by Manyata, which was of a judicial divorce. The qazi (Muslim cleric) does not have the power to give a judicial divorce to a couple, Sayed argued today. The petition challenged the order upholding the divorce, alleging it was premature. The Sessions Court had passed the order without allowing Meraj to lead evidence before the magistrate court, Mungekar said. Meraj, who is lodged in Arthur Road jail here, further said in his application that for divorce by 'Khula' system, 'talaq' has to be given by the husband. But Meraj never gave the 'talaq'. Earlier in May, a sessions court had set aside a magistrate's order which had asked Dutt and Manyata to appear in court to respond to charges of adultery and bigamy. The CPI general secretary was replying to a volley of questions from mediapersons on the CPM ambiguity over Mayawati’s candidature for prime ministership juxtaposed to his earlier suggestion. CPM general secretary Prakash Karat had denied projecting anybody as their prime ministerial candidate. The CPI leader conceded that the final decision would naturally be taken only after the next general elections and the party, which gets maximum number of seats after the elections, would lead in the race for prime ministership. The party had also blamed the misdeeds and failures of the Congress party and the government, which provided opportunities for the BJP to take advantage by default. The Left being the most credible secular force in the country as to continue to fight the communal forces,” the CPI surmised. According to the study over $1 trillion is being laundered every year by drug dealers, arms traffickers and other criminals in India. The report also comes close on the heels of the murky cash-for-vote controversy, funding of communal riots in Jammu following the Amarnath shrine land transfer controversy, and the latest bomb blasts in Bangalore and nefarious activities in Surat. Quoting from the 2008 International Narcotics Control Strategy Report, prepared by the US Department of State, the KPMG says India’s emerging status as a regional financial centre and informal cross-border money flows are the main contributors to growing money laundering in the country. Some common sources of illegal proceeds in India are narcotics trafficking, illegal trade in endangered wildlife, trade in illegal gems (diamonds), smuggling, trafficking in persons, corruption, and income tax evasion. India continues to be a drug-transit country, the US narcotics survey has said. The KPMG feels that in future the major challenge for the finance sectors like banking, brokerage houses and insurance companies will be combating money laundering and terrorist financing. It’s report also highlights the vote of confidence in Parliament, which exposed the prevalence of unaccounted for money in the country. A few politicians threw a large sum of cash in Parliament and alleged that there was an attempt to bribe them for their vote. This confirms the continued existence of a parallel banking system popularly called hawala, it says. According to Indian observers, funds transferred through the hawala market are between 30 to 40 per cent of the formal market, the report says, and noted that the Reserve Bank of India estimated official remittances to the country to be around $28.2 billion. He said he had explained to his Indian counterpart that Japan, being the only country to have suffered atomic bombs, has been helping the world in international efforts towards nuclear disarmament. Koumura also announced additional overseas development assistance (ODA) of $1.04 billion for a series of projects in India, including the proposed Chennai Metro, Punjab Biomass power plant and the construction of Hyderabad outer ring road. “Koumura also called on the Prime Minister and discussed with him a whole range of bilateral issues as well as international developments. Manmohan Singh is likely to visit Japan towards the end of the year. A bilateral trade treaty is expected to be signed during his visit. Mukherjee thanked Japan for joining the consensus at the IAEA that paved the way for approval of the India-specific safeguards agreement. M.S. Yadav, federation’s general secretary, also demanded that the interim relief should be given from the day wage boards were constituted. As per the recommendations of the wage boards, interim relief of 30 per cent was proposed from January 8, 2008, and the government had issued the reference letter for interim relief from the same month. Addressing the federation’s two-day national executive meet here, he told delegates that the Centre had given an assurance that it would fulfil the genuine demands of newspaper and news agency employees and an announcement regarding interim relief was likely to be made by this month-end. Meanwhile, the wage board is conducting a study to reclassify jobs in the print media and categories of newspapers in the light of changes brought about by advancement in communication technology. “As the nature of jobs in the newspaper has changed after the upgrading of communication technology, it was must for the wage board to reclassify the jobs as well as the category of the newspapers,” deputy director in the Union ministry of labour Harcharan Singh had said here while addressing a seminar on the working conditions of journalists and other newspapers employees in Punjab. The study, which had already begun, would be completed by December this year, he said. In a telephonic press conference from the US, US Ambassador to India David Mulford said the usage of the term “unconditional” was “over simplification” of issues considering that the issue related to the NSG. He noted that the US was seeking “clean exemption” from the NSG and was not using the word “unconditional” because there were “many moving parts” in the process, including the Separation Plan, the 123 agreement and the India-IAEA Safeguards Agreement. “It is somewhat a provocative word to be used,” Mulford said while specifying that it was his “personal view” as it could create difficulties in the process. “We are hoping for, I use the word, clean exemption. We hope the NSG will recognise and accept the moving pieces -- the (123) agreement, change of (US) law and so on and gives approval to this,” the Ambassador said. Mulford noted that member countries of the NSG would have different points of view but he expected the grouping to give a “clean” waiver to India. The Ambassador sought to discount the possibility of the NSG putting the condition that India sign the NPT, saying the US had “understood” that New Delhi would not sign the pact and their bilateral negotiations on the nuclear deal had proceeded on that assumption so far. Mulford said the US was working very closely with India in garnering support at the NSG, with President George W. Bush himself involved in the process. According to the report, presented at a conference organised by the Society on the occasion of Vascular Awareness Day here today, lack of awareness not only among the patients, but within the medical fraternity, has led to a number of amputations and disfigurement of limbs for a disease that can be easily treated in the early stages with medication and lifestyle modification programmes. City-based surgeon Dr Pankaj Patel, who attended the conference, said peripheral vascular disease mostly affects the legs symptomised by pain in the calves while walking. This can progress to the toes even at rest and can result in gangrene of the toes and foot. It is well established now that decreased blood flow in the legs is the biggest indicator of future heart attacks and strokes. A patient, who has blocked arteries of the leg, indicates 60-70 per cent chance of diffuse vascular disease, he said. Dr Patel said though the exact magnitude of peripheral arterial disease of the legs is not known, awareness among high risk groups and the general population could lower chances of future complications like heart attacks and strokes. Change of lifestyle and wearing of compression stockings by women during pregnancy can reduce the chances, he said. The project called “Revitalising local health traditions to enhance the health security of rural communities in Pynursla block, East Khasi Hill”, has been undertaken by the Society for Indigenous Knowledge and Practices (SIKAP) and Martin Luther Christian University (MLCU). A sum of Rs 30 lakh for the three-year project has been sanctioned by the department of Ayurveda, Yoga and Naturopathy, Unani, Siddha and Homoeopathy (AYUSH), union ministry of health and family welfare. The project is aimed at doing research on traditional medicines and uplifting local system of treatment using indigenous medicinal plants. The project has two components -- research on medicinal plants and how they are used for treatment of ailments by the local people. While addressing a press conference, DSGMC chief Paramjit Singh Sarna said today that the way jathedar Vedanti was removed, it was an insult for Akal Takht. Sarna alleged the jathedar was under pressure from the Akalis after he had praised Prime Minister Manmohan Singh as “a true and pure Sikh”. The Akalis had preferred to vote against the Prime Minister in the trust vote on July 22. Sarna said Vedanti was speaking up for the Sikhs like he had voiced his opinion on making public the black list of Sikhs based abroad. Sarna said the way the jathedars of Akal Takht were being removed or appointed it was shameful for the Sikhs. It was strange that Vedanti was not allowed to continue in office even as just two months remain for the tercentenary of the Gur-ta-Gaddi divas. AICC general secretary Rahul Gandhi would also accompany her in the three-day trip to Beijing in response to an “invitation” from the topmost person of the Communist Party of China, AICC general secretary Veerappa Moily told media persons. He said Gandhi would leave here for Beijing tomorrow night. Shah Rukh Khan and Farah Khan had earlier assured Kumar that the scene, which made fun of him, would be deleted from the movie. However, this did not happen and the movie was screened in all theatres without the deletion of the scene.